“Mercurial and fixed,” “familiar albeit fantastical.” Paradoxical terms such as these came up repeatedly in conversations with painter Jim Butler as he discussed his new "Synaptic Reverb" series on view at New York's Tibor de Nagy Gallery through December 22, 2017. The five glass-inspired large-scale canvases were created over the past two years, and each represents a detailed investigation of the behavior of light passing through glass. 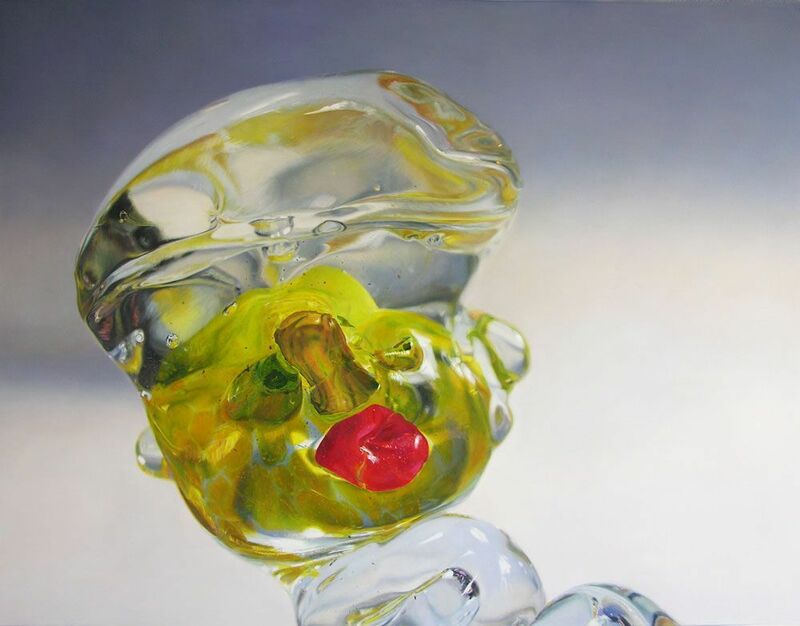 The oil on canvas images will tempt you to reach out and touch their intricate detailing and labyrinthine extensions of the glass sculptures, testament to Butler's skill with a brush, but also his keen insights into the qualities that distinguish glass from any other medium. "Painting and glass are, for me, flip-sides of the same coin. Both are about optics and color suspended in space…they even share the same compounds to make colors. But most critically, making glass for me is about drawing in three dimensions. Just like using charcoal or a paintbrush, hot-glass responds to inflections of the hand’s gestures, which makes it capable of revealing expressive intent of the mind. What's remarkable about both painting and glass is that both are capable of creating images through illusion, something that immediately struck me the first time I saw glass made. For the past decade I’ve been working to create both paintings and glass sculptures that focus on illusion and personal expression." Upon seeing such surreal paintings of sculptures, the viewers are left to question whether or not the featured sculptures themselves actually exist. Butler recalled his earlier days as an artist, when he first preferred to paint objects-ones that he found or created himself. Over time, he grew to more thoughtfully create the objects he intended on recreating with paint. As he expanded his expertise in glass, the subjects of his paintings became glass sculptures, allowing him to reach a new level of complexity in both mediums today. 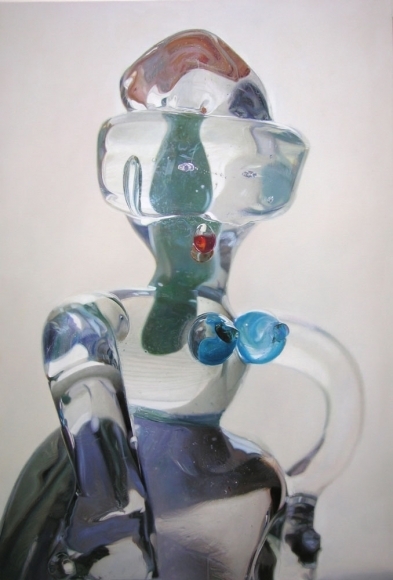 His work in glass leads him to new work in paint, and vice versa. "In order to to invent all of this in pictorial terms it made sense to first sculpt hot-glass personages unique to such an imaginary world. 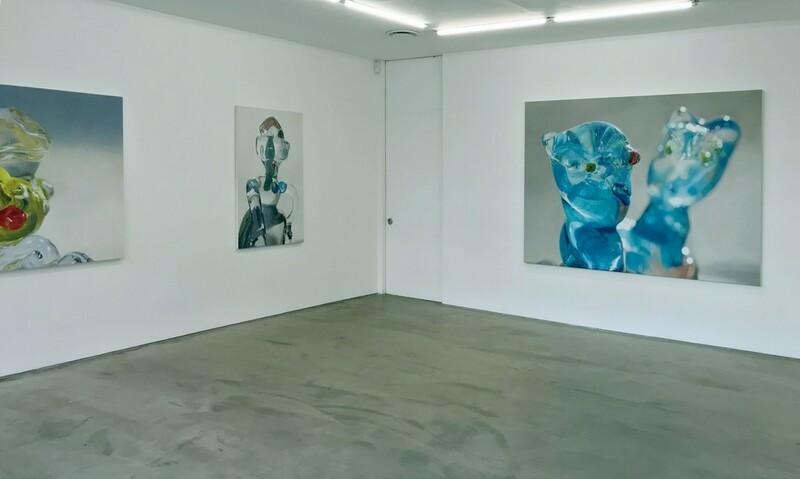 By depicting the fluid yet concrete optics of the small sculptures I make the paintings from, I found I could open a kind of spirit-world populated with strange, vivid figures immersed in shape-shifting spaces. They seemed to bathe in glowing environments of tenuous gravity….a kind of embryonic fluid where up might be down, until its not. Imaginary portraits, I painted them to speak to collective anxiety of what it is to be human. This seemed especially pertinent in our present condition where technology has led our fragile psychologies to a precipice of exciting yet threatening uncertainties." 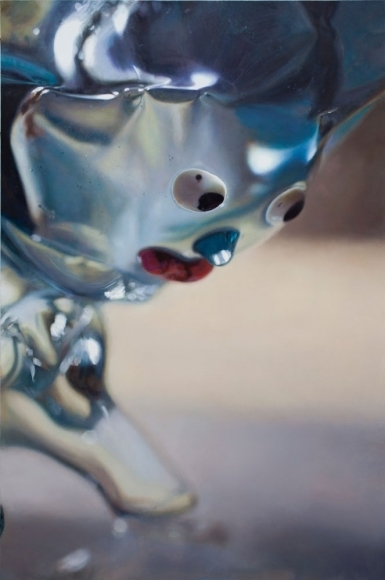 The transition between glass and painting seems to have opened up a new world for Butler. Where the two collide, anything is possible, he says. Asked to discuss what went into "Synaptic Reverb," from the ideology behind it to titling each piece, his answer was revealing. "The show’s title "Synaptic Reverb” refers to unpredictable and unstoppable mechanisms of our minds. Literally about how electrical impulses that fire neurons in our brains seems to create consciousness…or the illusion of it. Its amazing that we know something about the science of how this happens but don’t know what or why it is actually being made. Its mind-blowing that all we know as a species seems to be the product of something we can’t even define (consciousness). The titles of the both the show and the individual paintings were created while being painted. I always start with a visual idea (rather than a literary one) that leads to actual form-making. This could be through formal issues like space, color, texture or it could be about figuration and architecture. In this case I started the paintings with an idea about creating a group of characters. I thought of them as acquaintances of each other and myself…some better known than others but all sitting together, perhaps around a campfire (in fact I’ve started a painting of a glass campfire). As the images developed and I grew to know each of them and would naturally would give them names... just like in real life. Think of it like a painterly analog of a virtual world."